Sorry I’m a bit late this morning – have had problems with the internet! Wasn’t quite like the commercials where I was in a ball on the floor crying, but did wonder about getting my blog posted! 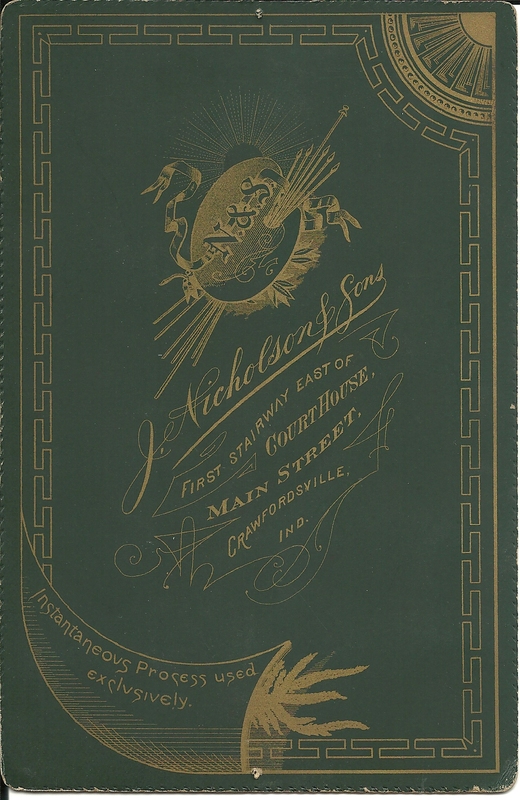 Today I have four photographs taken by Nicholson and Sons located in Crawfordsville, Indiana. Unfortunately I could find nothing on this photographer – although, according to the photos, he must have been in business for quite some time. 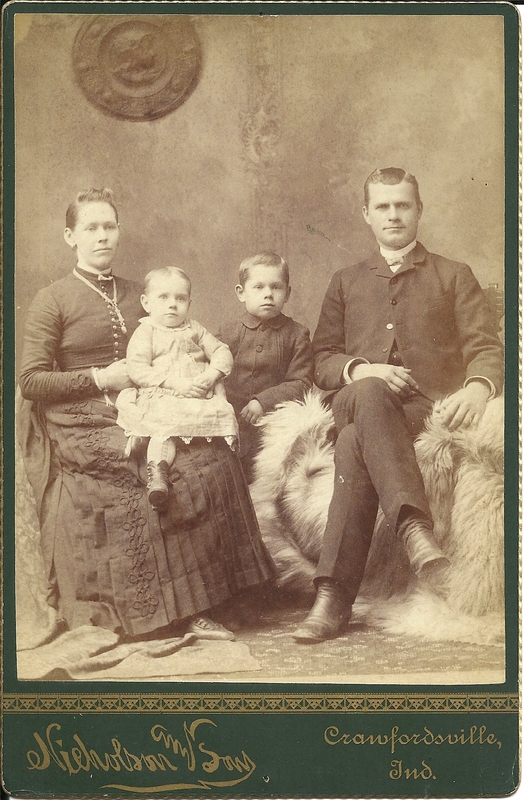 The first three are cabinet cards, the last an oval on a grey background. 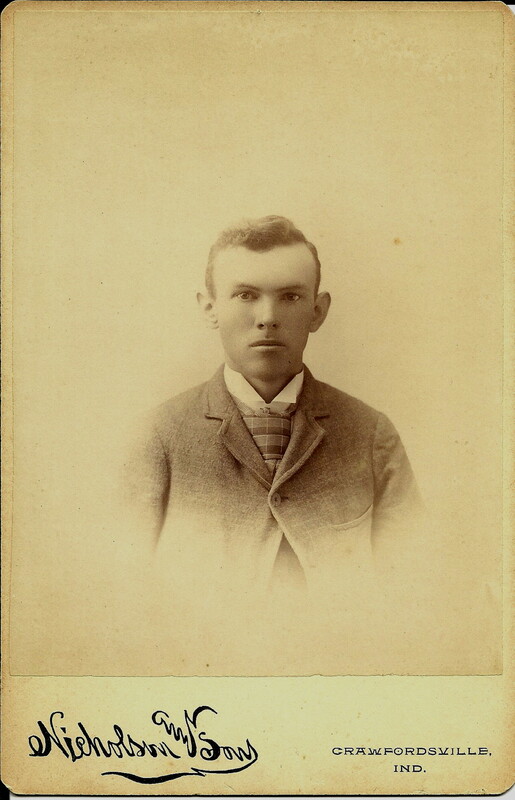 This dapper young gent is a good example of the 1870’s fashion which includes a more fitting jacket with smaller lapels and buttoned at the top. This gave a great glimpse of the vest, which we are unable to see in this head and shoulders shot. But look at his fantastic tie! Very, very wide – perhaps the widest I’ve seen – but I love the fabric design! If only the photo was in color! Wish this weren’t only a head shot – I wanted to see her dress! Do you notice just a hint of smile on her lips? Nice lace collar and brooch. No way to date this photo – or is there? We can’t date from the woman’s dress, but we do know that the scalloped edges, as shown on this photo, were from the late 1890’s and continued until 1900. Now we can imagine the huge leg ‘o mutton sleeves that this woman probably was wearing! Just a lovely family photo, from the little one perched on the mother’s knee (hard to tell if it is a boy or girl since they were dressed much the same when little), to the handsome little boy and his parents! According to the mother’s dress I would date this to the late 1880’s/early 1890’s. But more importantly, the dark green color gives us a very important clue. The previous two photos have a white or ivory background (sometimes hard to tell because of age!). Dark colored cards were introduced in the late 1880’s. Green is rarer than the more usual maroon and black. You can see the name and address of the photographer better on the dark cards, so it was good for advertising! In the late 1880’s the cards were colored only on the front, but by 1890 most cards had color front and back. 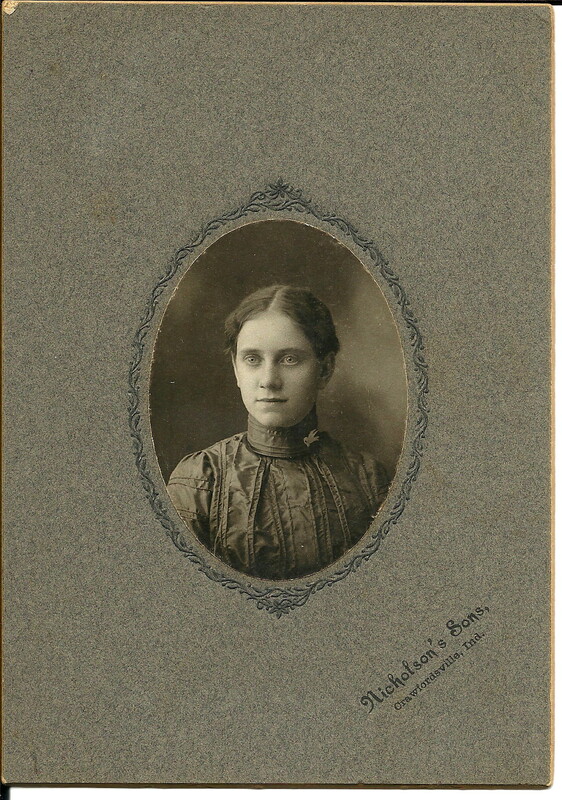 Our last photo is of a lovely woman with a very high collar and brooch. Just the color and size of the card indicates it to be taken around 1900. 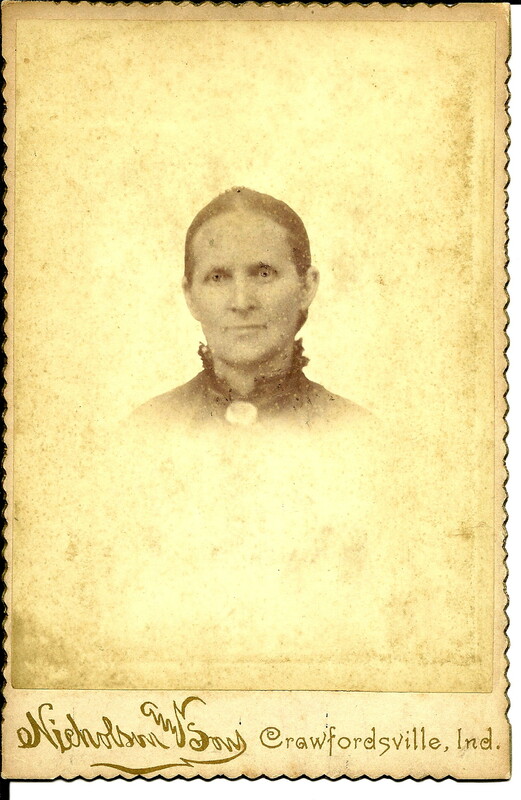 I could not find much about Nicholson Photography (on this card the name is Nicholson’s Sons – probably the father has retired or possibly passed away by this point), but I did find a photograph exactly like the one above of Carrie Nation! She visited Crawfordsville, Indiana, on July 4, 1901 – when this photo was taken! I have a photo of a baby , born in 1874, by this same photographer. I found your article very informative. Thank you!! Since I live close, i’ll be visiting the Crawfordsville library very soon. Let me know if you find more information.